From Mission BC’s Mission Springs Brewing comes their “Big Chief Cream Ale”. The beer pours an amber colour with an off white head. The aroma consists of grainy malts, citrus and a sweet finish. The flavour is of bready grainy malts, big citrus notes, with mild notes of earth, herbal and bitterness in the finish. The alcohol content comes in at 5.5% with an IBU of 19. This beer is not going to knock your socks off as it is a fairly basic beer. But there is nothing wrong with that it just wont challenge your palate. 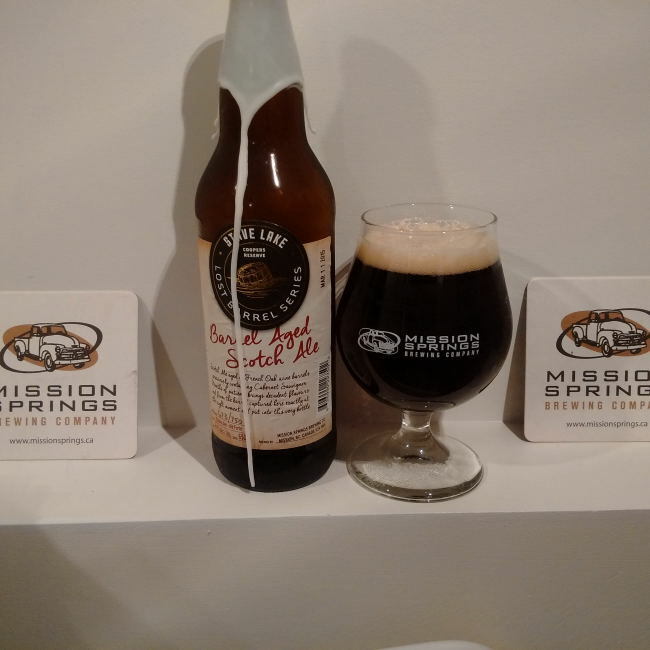 From Mission BC’s Mission Springs Brewing comes their “Spirit Bear Spiced Chocolate Imperial Stout”. The beer pours a deep black colour with a brown head. The aroma consists of all spice, chocolate, roasted malts and some sweetness. The flavour is of burnt coffee, chocolate, all spice, roasted malts, bitterness and earth. The alcohol content comes in at 8%. I was personally hoping for the chocolate to shine through much more with this beer as the all spice is really prominent. 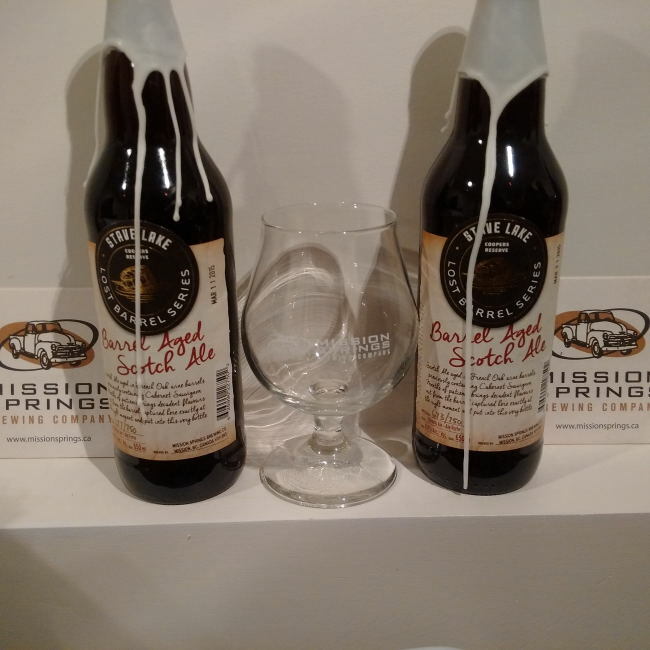 Mission Springs Brewing out of Mission BC have been quietly building up a brand new series of beers. This series of beer is called the Stave Lake – Lost Barrel Series and this is one of the first beers in the series. The beer is aa called “Barrel Aged Apricot Ale” but sadly with this beer they did not bother to number the bottles on this release like the last Barrel Aged Scotch Ale. This golden ale was aged in a blend of white and red French Oak wine barrels. The beer poured a deep orange colour with an off white head. The aroma consists of apricots, sweetness and some wine. The flavour is of apricots, sweetness, red and white wine, wood, lots of fruit and some oak and alcohol. The alcohol content comes in at 8%. Not as complex as their last barrel aged beer but this is really enjoyable and I would recommend you pick up a bottle if you can find it. Commercial Description: This golden ale has been aged to perfection for one full year in a blend of red & white French Oak wine barrels. After careful selection the beer was moved on to farm fresh apricots for a month of infusion. This bold ale has a beautiful balance of alcohol warming notes, oak and fruit leaving a pleasurable unique lasting impression of barrel aged intensity. Open now or later, but always enjoy with friends and family. From Mission BC’s Mission Springs Brewing comes their “Zeus Hopped India Dark Lager” a beer that the brewery calls a mix between a Cascadian Dark Lager and a Muncih Style Dark Lager. The beer pours a very dark brown colour with a brown head. The aroma consists of big roasted malts, coffee, chocolate and maybe a hint of hops. The flavour is of burnt coffee, huge roasted malts, smokey, earthiness, a hint of chocolate, huge bitterness and a very dry finish. The alcohol content comes in at 6% with an IBU of 75. This beer has lots going on and challenges your taste buds. This beer may not be for everyone but if you like a big roasty backbone with a generous hops bitterness then this is the beer for you (just like it was for me). 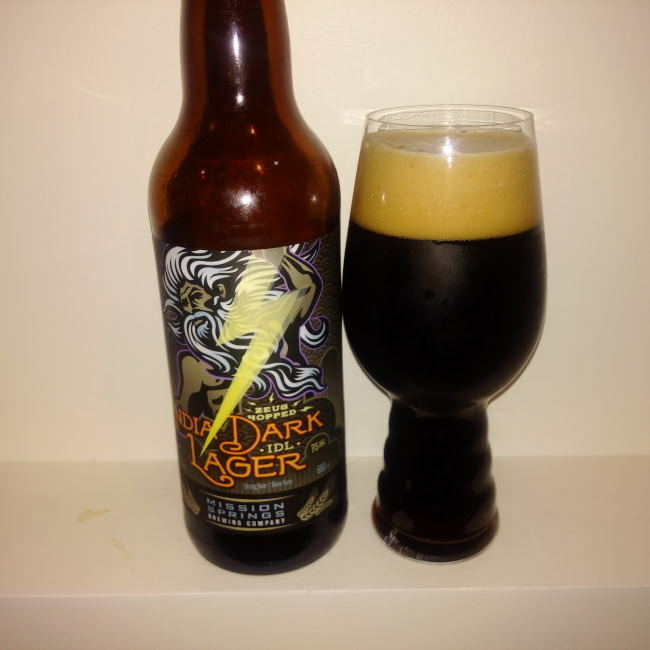 Commercial Description: Brewed with hops aptly named for the ruler of all gods, it’s no wonder this dark lager hits your palate like a lightning bolt of flavour. Born out of a love for artisanal handcrafted beers, here is a beer that defies style, crosses multiple genres, and demands no guidelines.